James Blair Bibby was born on October 29th, 1944 in Franklinton, North Carolina. The six five, right handed pitcher was signed by the New York Mets in 1965. Bibby began his career pitching for the Marion Mets in the Rookie League in 1965, going 2-3 giving up 30 earned runs in 24 innings. He then went off to serve in the military for two years during Vietnam, where he saw actual combat action. When he returned he was assigned to A ball Raleigh Durham in the Carolina League going 7-7. 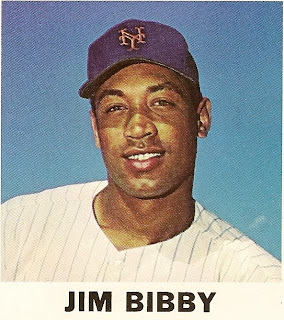 In 1969 as the Amazing Mets were winning the World Series, Bibby started out by going 10-6 at AA Memphis getting promoted to AAA Tidewater. He went 4-4 with the '69 Tides posting a 3.48, on a team that featured 14 game winner; Jon Matlack & 11 game winner; Danny Frisella. In 1970 he missed the entire season with an injury & returned to have a top year in 1971. In 1971 at AAA Tidewater Bibby led the club in wins (15-6) strike outs (150) innings (176) & starts (26). He was the top pitcher on a staff that included Buzz Capra (13-3) Jon Matlack (11-7) Don Rose (11-10) & Rich Folkers (7-11) all of whom would have major league success. At the end of the 1971 season, Bibby was traded along with Folkers, Art Shamsky & Charlie Hudson to the St. Louis Cardinals in exchange for Harry Parker, Jim Beauchamp, Chuck Taylor & Chip Coulter. The deal did help the 1973 Mets, as Parker did a fine job out of the bullpen & Beauchamp was a solid pinch hitter. But Bibby did go on to have a long career in the major leagues & had much success. 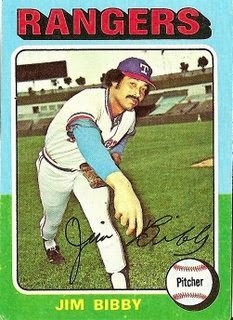 Bibby made his big league debut with the Cards in 1972 & in June of the 1973 season, was traded to the Texas Rangers for Johnny Wockenfuss & Mike Nagy. On July 30th, he threw a no hitter in Oakland, shutting out the World Champion A's while striking out 13 batters & walking six. Bibby would have seven double digit strike out games that season, including a 15 K performance on August 30th against the Minnesota Twins. 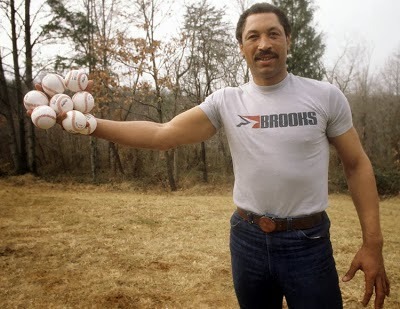 He ended up going 9-10 that season with 153 strike outs, posting the seond best strike outs per nine inning ratio at 7.7. He allowed just six hits per nine innings which was best in the AL. In 1974 Bibby won 19 games (10th in the AL) tied with three other 19 game winners. That season the A.L. proudly showcased ten twenty game winners. Bibby was second, on the second place Rangers staff to Hall of Famer; Fergie Jenkins, who led the league with 25 wins (tied with Catfish Hunter). Bibby also lost 19 games (4th in the AL) while walking 113 batters 3rd most in the AL) , throwing 11 wild pitches (6th most) & serving up 25 HRs (8th in the AL). Over the next few years he was used both as a starter & reliever, getting traded to the Cleveland Indians (with Rick Waits & Jackie Brown) in 1975 for Gaylord Perry. There he went 13-7 for the 4th place Indians in 1976 behind Pat Dobson & a young Dennis Eckersley. After spending three seasons in Cleveland (1975-1977) he signed with the Pittsburgh Pirates as a free agent in 1977. 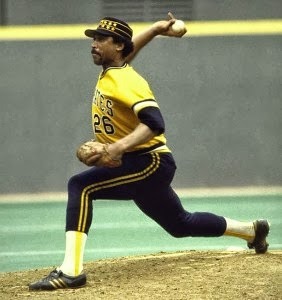 In 1979 he was 12-4 with the league's best winning percentage (.750%) for the World Champion Pittsburgh Pirates. He posted a career best (up to that pint) 2.81 ERA , striking out 103 batters in 110 innings. Post Season: In the NLCS against the Cincinnati Reds, he got the start in Game #3 against Frank Pastore. Bibby allowed just one run on four hits in seven innings. The Pirates used six pitchers that day, winning the game on a Dave Parker base hit to score Omar Moreno in the 10th inning. In the World Series against the Baltimore Orioles, he started Game #4 pitching into the 7th inning, allowing three runs (two earned) striking out seven in the 9-6 loss. He then started the final Game #7, against Scott McGregor, but was relieved after four innings when he gave up just one run. He returned in 1980 to win 19 games once again (3rd most in the NL) while posting the league's best win percentage for the second time. In the strike shortened 1981 season, he was 6-3 but then needed surgery after suffering a torn rotator cuff. He missed all of the 1982 season, returning to go 5-13 in 1983. He signed with the Rangers again in 1984 ending his playing career there. In a 12 year career Bibby was 111-101 with 1079 strike outs & 723 walks in 1722 innings of work over 340 games posting a 3.76 ERA. Retirement: He earned himself a bachelor's degree in health & phys ed. from Lynchburg College in 1980. 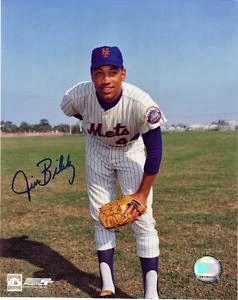 Bibby pitched for the Senior Professional Association in Florida in 1990. After his pitching days, he coached at Lynchburg for the Mets & then Red Sox from 1985-2000. There he is a legendary coach, having his #26 retired by the Hillcats. In 2010 he passed away at age 65 due to bone cancer. Family: His brother (Henry) & nephew (Mike) both played in the NBA.